Simple interest is computed on the actual balance outstanding on the payment due date. Precomputed interest is calculated on the original principal balance. The interest is added to the original principal balance and divided by the number of payments to determine the payment amount. ... the Rule of 78s is no longer an acceptable method of accounting for loan income. The acceptable method for accounting for loan income is the actuarial method. Definitions of simple interest differ, e.g. the naïve version here: What is 'Simple Interest'. However, by contrast, insofar as "Simple interest is computed on the actual balance outstanding on the payment due date. ", this is what is used by standard (actuarial) methods. The simple interest (actuarial) method also differs from the Rule of 78s. Finance charge, carrying charges, interest costs, or whatever the cost of the loan may be called, can be calculated with simple interest equations, add-on interest, an agreed upon fee, or any disclosed method. Once the finance charge has been identified, the Rule of 78s is used to calculate the amount of the finance charge to be rebated (forgiven) in the event that the loan is repaid early, prior to the agreed upon number of payments. So taking a simple example: a 12 month loan repaid early, after 9 months. By simple interest (actuarial) methods, using formula 1 (derived below). However if the loan is repaid early, after 9 months, using formula 2. If this was calculated by the Rule of 78s, with the finance charge taken as the total interest due for the 12 month loan. So in this case it disadvantages the borrower to use the Rule of 78s. This is a long way from 204.60, but then the demo interest rate is quite high, accentuating the disparity. The naïve simple interest method is otherwise disregarded in this answer. Demonstrating the interest calculations graphically, it can be observed that the interest payments calculated for months 10, 11 & 12 by the Rule of 78s are less than the simple interest/actuarial calculations. The actuarial method, in relation to a loan (as you mentioned) and its repayment is generally associated with repayment of loan at reducing balance (the method though can be used for many other purpose, on some cases on appreciating balance). For example, let's say you have borrowed $1000 at an interest rate of 10% to be re-payed in 20 years with one yearly constant payment (which works out to about about $116 per year, put the above values in the calculator, this also gives detailed breakdown). The idea is at the end of 1st year, when you pay $116, $100 goes towards settling the simple interest of 10% on $1000 for 1 year, the balance $16 is reduced from $1000. So your next years principal is $1000-$16=$984. Observe the reducing balance, if you keep paying the same amount every year it would finally result in full amortization of the loan in 20 years. 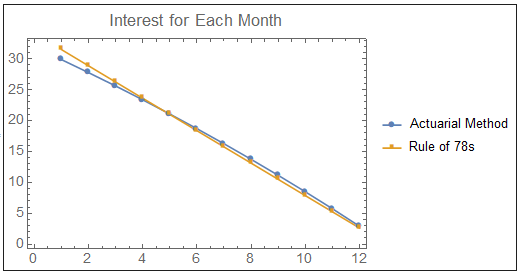 The concept of simple interest is used to calculate the interest on remainder balance. Not the answer you're looking for? Browse other questions tagged interest or ask your own question. Why is the breakdown of a loan repayment into principal and interest of any importance?